Happy Birthday Conker - what a wonderful display too ! Oh, he looks absolutely gorgeous. Happy Birthday Conker.... lovely heathers.... my Ella would have been 16 last week... still cant beleive shes not with us anymore.... so glad conker is fit and well now.. Happy, happy birthday conker! He nearly shares a birthday with my two girls, they are 6 on Sunday. Here is a recipe for a doggie Birthday cake!!! Mix the squash and monce together. Line a bowl with the squash skin then fill with mince. Leave to cool. When really cold, turn out like a cake!! Cut into slices for the Birthday pooch!! Happy Birthday Conker. He is so beautiful TT. My favourite breed of dog. The heathers are lovely too. The heathers seem to be doing fine after the very cold winter ..
Gorgeous display there Terrtoonie and Conker looking so proud and well. Happy Birthday Conker, you dont look a day over 2! Thanks Tetrarch ... Conker does look young ..
Great to hear the good news about Conker TT he certainly looks wonderful, Oh and a good selection of heathers there. Hi Bob ~ thanks ... Conker is enjoying life. 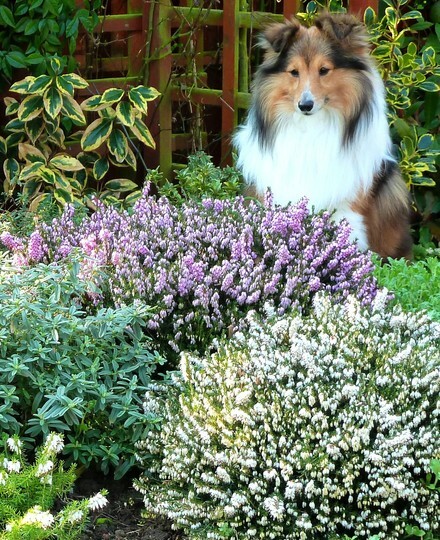 what a lovely photo ~ how could it be anything other when its set in a beautiful garden and starring such a gorgeous dog! what i cant get over is how conker is smiling and approving of the garden! Conker is very much the actor isn't he. I suggested he check on the heathers and he came up with the appropriate expression of approval ... Lol. happy birthday Conker, you look so healthy after going through such an ordeal! Aww, he looks so happy :) Birthday wishes Conker!!! Conker is stunning! I used to have a collie....who I lost to old age a few years back. Your garden is very pretty too! ... I wonder whether the very cold weather has improved them ! happy birthday Conker you look wonderful. Very pleasent expression. Thankyou enjoy. happy birthday Conker ! !and wishing you lots more of them!!!! You've made us all smile, TT - such a gorgeous photo, and it makes me want to hug Conker. No wonder you are so relieved that he's made it!! Fabulous. Wonderful pic, Tt, and Many Congrats, Conker, on everything! What a gorgeous face Conker has. I hope he stays healthy. Our dog just had his 10th birthday. It is sad to think he won't be around for too many years. They bring such joy to our lives. I think your dog is called Brownie ? Yes, Brownie is his name. It 's hard to believe he is 10 already. The years pass much too quickly. You must have seen his picture then. You have a great memory. ... cuddly Brown Bear ..lol. Yes. The years pass fast. They seemed to stay smallish, and then this year have blossomed suddenly, and become bigger ... I'm wondering if they liked the cold winter ! I've just popped out to check on them and they appear dead, unless they regrow from under the ground ? Over the years, mine have always grown back, but I guess after THAT Winter, we shouldn't be surprised at their loss. I've scratched a piece of the wood, dead as a dodo! Oh well, here's hoping some seedlings appear in the back garden, as they do most years. Lovely to see Conker looking so well. Flowers are beautiful too! We've been out day... having fun, discovering three garden centres we hadn't visited previously... They are all centres which welcome dogs. A very happy belated birthday to gorgeous Conker sitting there in your equally gorgeous heathers!! I didn't know he had been so ill, he looks so young and healthy! Long may it continue, we'll do anything for our pets won't we! Our two kitties, Chloe and Bear send a 'prrrinng!' and a good pampering! I gladly join the chorus of congratulations and good wishes. He seems to enjoy lilac flowers, like me! Beautiful photo TT...I am so happy to see Conker looking so well. Hi Cris ... Thanks ..
Hi TT just thought i'd let you know I've aquired a new Heather this week...'Winter Chocolate'...will be interest to see how it develops..